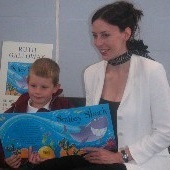 Ruth Galloway is an award winning author and illustrator, who has worked on a wide range of children's picture books. Her books have been translated into many languages, read on children's television programmes, and are enjoyed by children all over the world. I illustrate my picture books in acrylic paints, creating bold, brightly coloured images that bring my characters to life and are full of humour and energy. I really love to share my books with children as well as involving them in the creation of new books and stories, pupils often get a sneaky peek at new books before they have reached the shops! My sessions are suitable for nursery level, keystage 1 and keystage 2 children and I am CRB checked. I read 2 stories with the help of some of my fun and friendly puppets, and my magic drawing board. I then discuss my books with the children. There is a break for a short stretching activity and I finish by drawing different animals for the children to identify, with hilarious results. I can also create pictures for the classroom as a reminder of my visit. I talk about being a writer and illustrator and explain how a picture book comes about, showing original artwork and drawings in progress. I read and analyse a story. Then I guide the children through the creation of a character and setting, to inspire them to create their own story, using various fun methods to explain concepts such as 'wow words' onomatopoeia, alliteration, rhyme, rhythm and flow. I draw the 'story mountain', and demonstrate how the children can use it to plan their very own stories. My current fees are based on the Society of Authors recommended rates. Please get in touch for more details. A flipchart is required for all sessions. Please make sure this is in working order, is set up and ready, and has a proper flipchart pad, rather than loose sheets. I am always happy to sign (and do drawings in) my books, but no bits of paper please! Books for the children to buy can be provided, and are priced at £6.99 each. I have visited schools all over the South East of England, and throughout the UK. Last year I was invited to schools in France, and Holland, and held workshops at West Cork Literary Festival in beautiful Southern Ireland. I am happy to travel further afield, so that I can come and share the amazing world of creating illustrations, characters, stories and books with children and adults. I have written and illustrated a large number of books, here are some of my most popular! They are enjoyed around the world by children who love sea-creatures, sharks and silliness! Smiley Shark may be the biggest fish in the ocean but he's also the friendliest and the funniest - and by far the smiliest. So why won't the other fish let him join in their games? Soon Smiley doesn't feel much like smiling any more. Oh no! Smiley Shark has the biggest hiccups ever! Hic, Hic, Hicuuuuuup! Soon he is doing roly-polies with Starfish, being tickled by Octopus, and holding his breath with Pufferfish. But nothing's working! Tiddler was always fidgeting. He wriggled and squiggled, until his mum told him to go out and swim till he was tired. So Tiddler swam out into the deep sea, where he met limpets and jellyfish, he went further until he reached a big, dark cave. "Brightly coloured and lively illustrations abound on the pages of this amusing tale ideal for reading aloud." Nursery Education"
Octopus has eight twisty tentacles and he loves using them to tickle the fish. But when Octopus tickles Oyster, she drops her precious pearl and it is lost. Oh no. Will Octopus be able to get it back?